Sacred Natural Sites are critical places within ecosystems, such as forests, mountains, rivers and sources of water, which are of ecological, cultural and spiritual importance, and exist as a network embedded within a territory. Despite their importance, the capitalist development paradigm of gross accumulation by any means has seen most SNS destroyed and many local and indigenous communities lose their livelihoods and sense of belonging. This issue deals with the impacts of mining in Sacred Natural Sites in Africa, with ABN partner organisations speaking about the experiences of the communities they work with in fighting for ecological justice, food sovereignty and land rights. 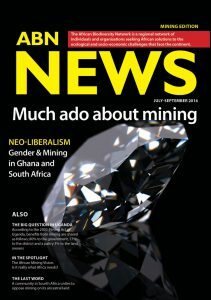 In addition, we have a piece on the intersections between the extractive industries, labor and gender in Africa.